At a Mexican restaurant in Dallas, Texas, half a dozen lawyers are talking about patents. The conversation turns to the activities of the so-called trolls, and they compete for the craziest examples of the patents they use in lawsuits. "It is the guy with this scanner patent," says one. "They claim that anyone who uses a scanner to scan documents, email the documents, owes them a royalty of $1,000 [£645] per employee." "There are a couple of different trolls who claim that they invented the technology behind wi-fi," says another," and they are suing all kinds of companies, bars, hotels, restaurants. Anyone who offers wi-fi, they are saying you owe them money." A third lawyer chimes in: "And then there's the peanut jelly sandwich patents..."
These patent lawyers work mostly for defendants, but it is hard to find anyone who thinks America's patent system has not gone just a bit mad in recent years. Much of the blame is being placed at the doors of what are sometimes known as non-practising entities - or trolls, for those who do not like their work. "A patent troll is someone who buys patents and then sues people," explains Alan Schoenbaum, general counsel at the cloud computing firm Rackspace, which has been targeted by patent lawsuits. "Generally they are not inventors, they're entrepreneurs or finance people." Once, patent trolls were just a minor irritant for anyone launching a new product - not any more. "Our research has shown that in just five years the United States patent system has been turned on its head," says the University of California's Prof Robin Feldman, one of the authors of a major study into patent litigation. "The majority of patent lawsuits today are filed by entities that don't make any products, in other words in your terminology by patent trolls," she says. "Their business model is based on extracting money from those who do make products." Although some trolls develop their own patentable inventions in-house, most buy the technologies second-hand. Innovators and companies are often willing to sell their rights as it guarantees them cash for ideas that might otherwise remain obscure. It's not just the trolls who are keen - many recent tech takeovers have been driven by the desire to acquire patent libraries, perhaps most notably Google's $12.5bn purchase of Motorola Mobility in 2012. But the trolls are vilified because of the perception that their legal tactics are more likely to hold back innovation than spur it on. I set out to try to find some of these trolls and hear their side of the story. The monopoly property right granted by a government to the owner of an invention. But first, I ask Alan Schoenbaum to describe their tactics. First step - get yourself equipped with a patent war chest: "The patents that they acquire are generally software patents. And they are very broadly written. They are very difficult to understand and oftentimes inscrutable." Then find companies to target, threatening them with extremely costly legal action unless they pay a licensing fee. "Defending a lawsuit is extremely expensive. It can range from as little as several hundred thousand dollars up to $5m or $6m to take it all the way through trial," he says. "They play on that fear that the defendant is going to spend a lot of money to defend itself and it is simply cheaper to pay them off." When they do reach a deal with their targets, there is almost always a non-disclosure agreement, and the whole process is so shrouded in secrecy that it is difficult to find out what is going on. Take the case which has seen a company called Uniloc suing a clutch of games developers, including the company behind the wildly popular Minecraft. One of the defendants is X-Plane, which makes flight simulation software, and its owner Austin Meyer was vocal in denouncing the lawsuit when it was launched last year. He wants to talk to me about the case - but explains that the lawyer representing him and other defendants thinks that unwise. So I decide to drop in on Uniloc's headquarters in a suburb north of Dallas to seek its side of the story. When I search a database of patent cases, Uniloc's name came up 85 times, so you might expect it to be a substantial business. That is not how it seems when I pitch up at Suite 380 in a modern office building. A very polite receptionist comes out of what appears to be a small office to tell me nobody is available. I fare even worse when I try to visit the global headquarters of Lodsys, a company that has launched dozens of lawsuits and sent letters demanding licence fees to British developers, including at least one teenager. President Obama has accused tech industry patent trolls of trying to "hijack somebody's idea and see if they can extort some money out of them". To tackle the problem he has called on Congress to introduce steps designed to discourage the firms from suing. * Requiring the parties who send demands to disclose who ultimately owns the patents, so they cannot hide behind shell companies. * Make the demand letters public and searchable. * Make it easier for the courts to make the losing party pay for the winner's legal fees. 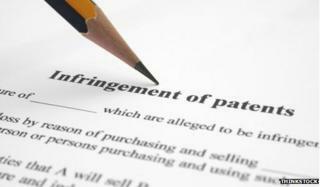 * Offer better legal protection to purchasers of off-the-shelf products to safeguard them against the risk of being sued for the manufacturer's patent infringement. In addition the president announced steps he was taking that were within his powers. * The US Patent Office will require patent applicants and owners to provide updates on who owns what if they come to the organisation with a dispute. The aim is to help defendants know more about who they are facing and the connections that exist between the various trolls. * Patent examiners are receiving extra training to try to minimise the risk of overly broad claims being approved. Like a number of these companies, Lodsys keeps an office in Marshall, the small Texas town which has become a hotspot for patent litigation. But the Lodsys headquarters is one locked door along a corridor of apparently empty offices. There is a piece of paper on the door asking the postman to leave mail in the foyer, but no other sign of life. Finally, though, I find someone who is willing to talk. Erich Spangenberg, has a company called IP Nav, described by Rackspace's Alan Schoenbaum as playing in the big league of trolls. His firm boasts that it has raised more than $700m so far in licensing fees for the patents it holds. His Dallas headquarters certainly spoke of a substantial business. The glass doors at reception are etched with the message: IP Nav Full Service Patent Monetization. Inside there are plenty of eager young staff at work, many of them physics graduates, according to Mr Spangenberg. In our half-hour interview, he is extremely robust in defending the ethics of his work, and combative when I try to suggest that he and his ilk may be harming innovation. Does it upset him to be called a troll? No, but he says the word has become meaningless: "Anyone who asserts a patent unless you're Google is apparently a troll. So I don't think it's descriptive, the accurate word is patent owner." He listens to my description of little companies being harassed by owners of bizarre patents with impatient scepticism. "There is anecdotal abuse in every industry," he replies. He paints himself as the champion of the little guy taking on the mighty corporations: "We don't push companies with less than $100m in revenue - it doesn't make sense economically." He tells me I have misunderstood what a patent is. Rather than being a defence for an invention, it is a property right defined in the US constitution - and just because you own one, that does not mean you have to make something with it. "Much like an architect can design a building but does not build it, a songwriter can compose a song but doesn't have to sing it, an inventor can get granted a patent and ultimately is not forced to practise it," he explains. As for his tactics, which can involve demanding a licence fee without revealing exactly which patent has been infringed until his target pays up, he is unrepentant. He cites his recent clashes with Rackspace: "If you send them a letter without requesting the confidentiality, they can immediately file a lawsuit down in San Antonio, which is exactly what they did recently." Mr Spangenberg is happy to admit that the patent monetisation business has been extremely lucrative for him - his $30m Dallas home is currently on the market. But even if it is legal, I put it to him, many people see it as unethical. "I don't understand the argument," he retorted. "Let's talk about who wants to promote innovation and who doesn't. Do you really believe that what Google wants is to eliminate the patent system to further promote innovation? Sorry, I don't believe it." And, referring to calls for reform, he goes on: "India and China are celebrating what we are doing to our patent system." Change may be in the air, as politicians right up to President Obama criticise the current patent system and attack the trolls. Even Mr Spangenberg concedes there do need to be some reforms - but in the meantime he is getting on with the serious and lucrative business of patent monetisation. Rory's documentary Patently Absurd will be broadcast at 20:00 BST on 20 August on BBC Radio 4. Are patents good for you?